A survivor of the Nazi concentration camps, where he spent three years as an adolescent before escaping to Palestine in 1946, Dan Pagis testifies to the Holocaust, as he must, but he does so with a voice both disembodied by terror and charged with compassion for his persecutors. Pagis’s poems do not focus exclusively on the Holocaust, and his ability to range playfully from historical fact to science fiction is astonishing. 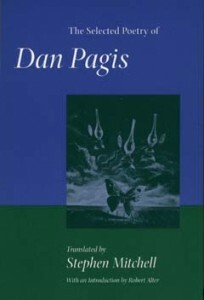 Translated into meticulous and superb English by Stephen Mitchell, Pagis’s wild imaginings and insights into human existence seem both familiar and hauntingly inescapable. the straw body waits for the final shudder. the past age, which was filled with sun, has passed. Now it’s cold. The nuts are too hard. The carnivores are getting more and more supple. This is it, I’m emigrating. Good-bye. How good this silence is. I’m almost, almost perfected. for the invention of chess. The centuries I ground between my jaws. Never expelled from Mama’s cozy womb. the only one that burst out of the silence. or a garden, or a town. rock, beneath this the fiery prison. fire in the fields, memory. Far beneath these, there were houses, children. the only moon of that world. It blew itself out even before this. moons have lit up. Have burned. in a city park I once beard of. for a tree? For the growth of a bench? For a child? — No, that is not right. Memory is not there. What you said is only a parable. must be precise. I expected more from you. It doesn’t matter. Do not fear, my servant. You will not fail. Dan Pagis’s poems have been through the fire — its heat, its suffering, and its refinement. They ring clear as crystal. Each like a cherished glass permits Pagis to toast the human spirit. 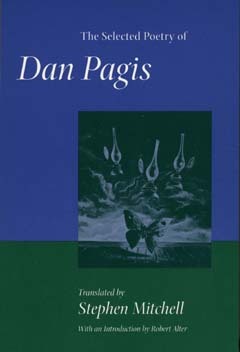 Pagis was one of the most vibrant voices in modern Israeli poetry. Mitchell creates supple, luminous renditions. One has to remind oneself that this is a translated text, because the poems are made so powerfully available to the English-speaking reader. I don’t know any Hebrew… But knowing English is enough to know that Stephen Mitchell’s translation is one of those exceedingly rare examples of rendered poems that are poems in their own right. Mitchell’s English captures all sorts of verbal complexities; you can bear down on these poems, and they don’t give way to the excuse that, after all, they are only translations. The poems glow with pleasure in themselves. One can hear a kind of laughter resonating, as if having surpassed the moment and its trial, having presented suffering yet having set distance from it through the medium of his art. Though Dan Pagis has died too soon, may we learn from him to live.